It must also be stressed that during prehistory, the production of wax was as important as honey and not, like today, a secondary product merely of interest to the beekeeper. In squeezing the honey the wax is automatically harvested at the same time. 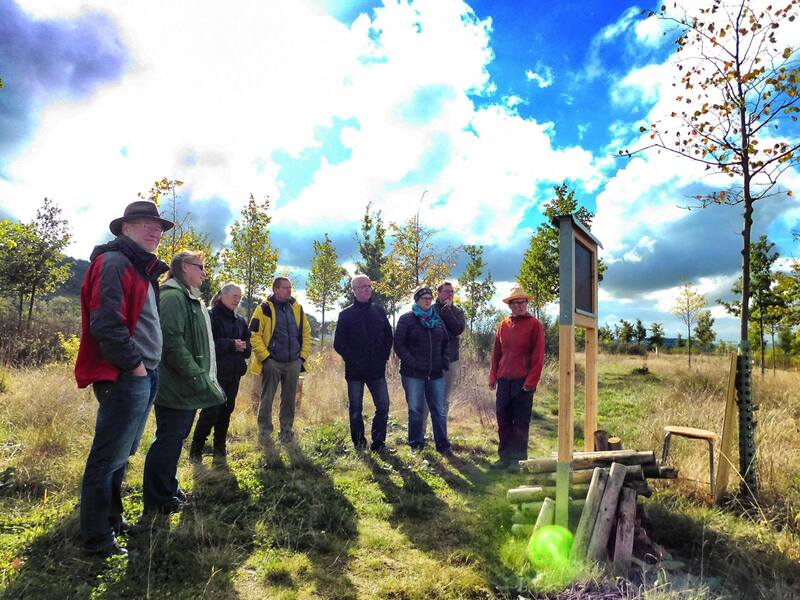 In cooperation with the archaeological open-air museum Zeiteninsel in Germany, the first practical archaeobeekeeping project was initiated recently after a themed guided tour in October 2016. The Zeiteninsel is an EXARC member and will construct five themed archaeological time periods within their grounds: Mesolithic, Neolithic, Bronze Age, Iron Age and the first century AD (www.zeiteninsel.de). 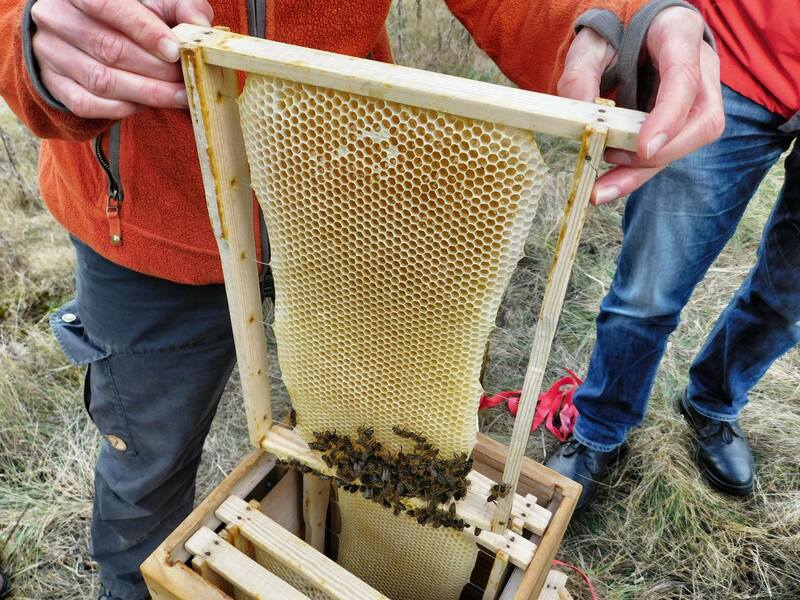 Traces of prehistoric beekeeping in Central Europe are rare until the 1st century AD. The occurrences of these archaeological finds were displayed within posters for each time period. (e.g., fig..., an image of the Bronze Age poster on display.) The participants of the themed guided tour were nearly all beekeepers and after the tour, many discussions ensued about the practicalities of the archaeological finds. Spanish Mesolithic rock art, dating circa 9000 BC, depicts imagery of the so-called honey hunting. The best known petroglyph depicting beekeeping was found in the Cuevas de la Arana (Arana Caves), located in the municipality of Bicorp in Valencia, Spain. The western or European honey bee (Apis mellifera ) is a troglobiont (an animal that has a cave dwelling mode of life) and their hives have been found in both rock clefts and wood. It is likely that the imagery carved at Cuevas de la Arana illustrates beehives in small rock cavities rather than in trees. Although the actual knowledge about beekeeping for this period is quite limited, we can see that prehistoric people gathered honey from caves, taking with them some kind of bag (made of leather or bark perhaps?) into the caves to collect the honeycombs (Crane 2001, 19-24). In order to enter the caves they had to climb some kind of ladder and sometimes even a group of people were involved in the process. The Alpine lake dwellings can give us some insight into Neolithic, whereby evidence of beekeeping exists within waterlogged deposits. Organic material was used in prehistoric beekeeping and the tools involved were probably so universal that they were not linked to beekeeping in a prehistoric context (e.g. sifters, textiles or knifes). Two rather small wooden pipes were found in the Neolithic lake dwelling at Arbon Bleiche III in Switzerland. Although there was no direct proof that these were used as log-hives for beekeeping (neither wax nor bees were found), they were discovered in an upright position, adjacent to each other on a small square. 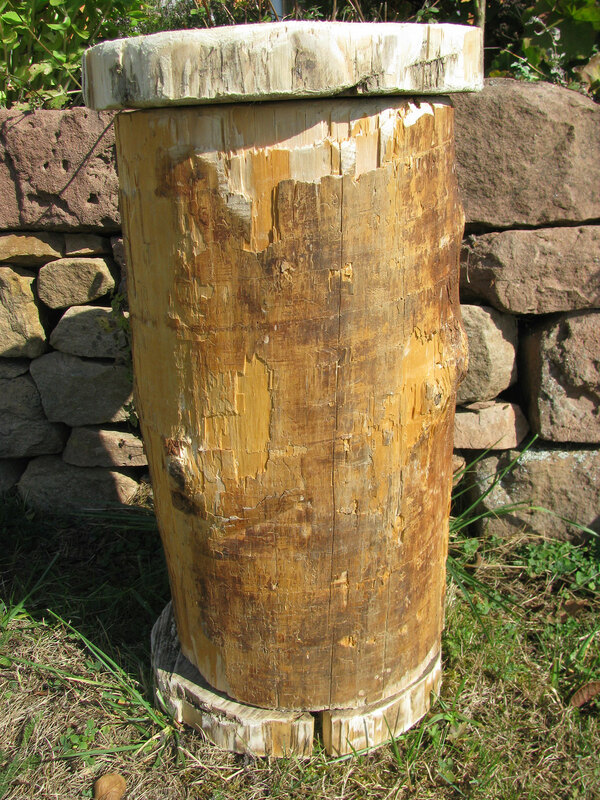 These kind of log-hives were used and still are ,occasionally, in modern day France.Therefore, the ethnographic interpretation by researchers have assumed a connection with beekeeping (De Capitani et al. 2002, 112f). Within the guided themed tour at Zeiteninsel, the Neolithic period display contained replicas of log-beehives and these are to be populated with bees during 2017. 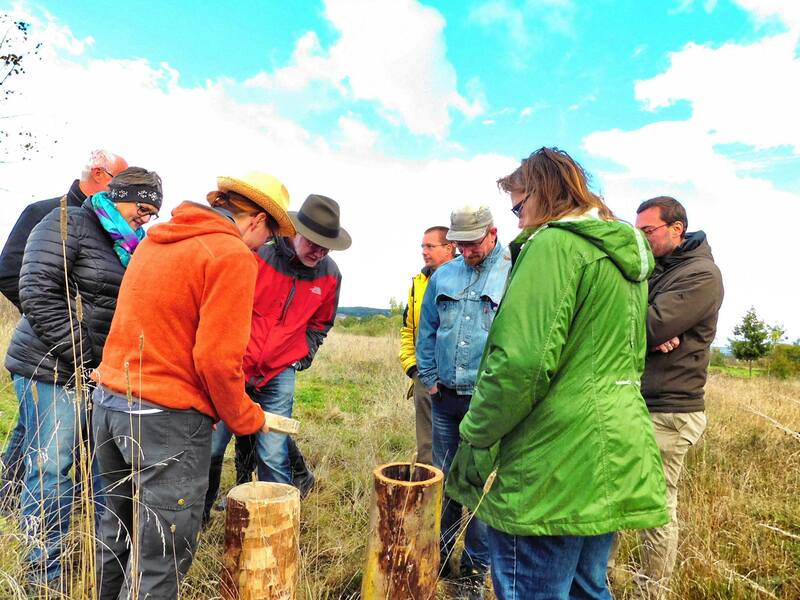 Lively discussion ensued between participants concerning the ‘bee-suitability‘ of the prehistoric log-hive, as there is considerable archaeological evidence for honey and wax harvesting during the Neolithic period. Indeed, an international research team found wax adhesion within ceramic finds which were widespread over Europe, among others for example at sites occupied by the earliest farmers of Austria and Germany, at Brunn am Gebirge and Niederhummel (Roffet-Salque et al.2015, 226-230). A Bronze age find from Berlin Lichterfelde (Germany) is interpreted as being connected with beekeeping. In this incidence a larger tree trunk relative to the Neolithic finds was used as secondary construction - to rebuild a well. Apart from the analogy in shape and functional details (e.g. hive entrance, grid for stabilisation), there was no direct evidence of beekeeping (Lehmann 1965, 70-76). During the Bronze Age, a particular cultural-technological innovation presents strong evidence for beekeeping management- the use of the lost-wax-technique in bronze casting. Again, it is the wax which is of particular importance and not - what is common as focus of today - the honey. Indirect proof of beekeeping activities within the Iron Age is evident by finds of honey. One of the most prominent samples of evidence is the 500l bronze kettle which was filled with approximately 350l of mead associated with the princely burial at Hochdorf (district Ludwigsburg, Germany). This burial site was extremely rich in burial goods, where, beside other finds, there were drinking vessels for a feast, together with the large bronze kettle. Due to corrosion it was possible to tell that there were 300-400l inside the vessel when buried. At the bottom of the bronze kettle was a sediment which contained 88g of beeswax, indicating that mead was the most likely contents. An estimated quantity between 73-292kg of honey was used for the preparation of the mead (Körber-Grohne 1985, 126-128). During the first century AD, the number of finds become more frequent. At least two from areas that are now located within Germany are related to beekeeping. Specifically, I would like to focus on a discovery from a terp (an artificial dwelling hill at the coast) in the northern sea area of Germany, the Feddersen Wierde (Ruttner1981, 164-166). 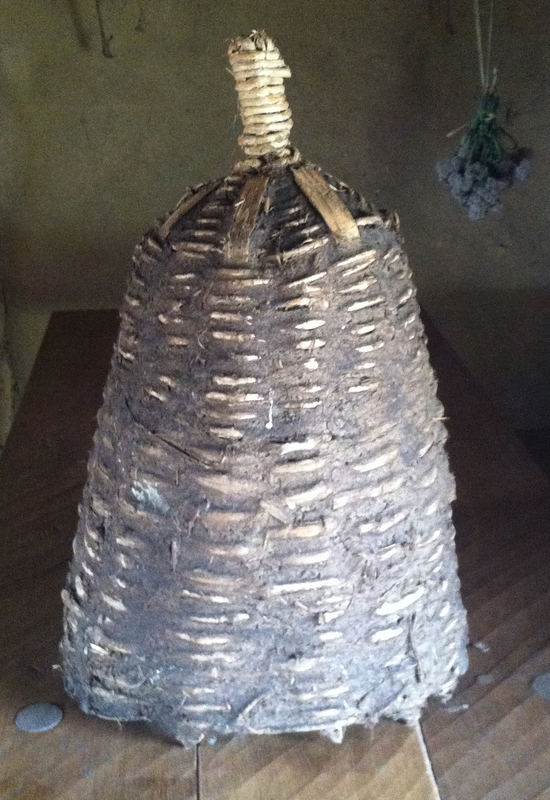 I intend to expand my research and practical work with this find as it is the oldest example of a bee habitation which is not a log-hive: it is a skep made out of rods. The plan is to rebuild this skep from the Feddersen Wierde in the near future and test it in practical beekeeping as well. As it will not be possible to look into the actual prehistoric log-hive reconstructions when it is filled with a bee colony, I have installed a modern wooden beehabitation with modified frames to imitate the size of long-beaked honeycombs in a small log-hive like, for example, the Neolithic finds. In future, this will provide an exciting insight into the bee colony, especially for an audience that is not experienced in beekeeping. Finally the guided tour ended with a tasting of products, which were in the context of a prehistoric apiary: honey lemonade with meadowsweet, hazelnut honey croquant and pressed honey. I would like to explain how and why these products connect with archaeolocial finds. Remains of mead were a common find in burials throughout prehistory. There are finds of mead remains with meadowsweet pollen, but in at least one case this pollen was immature, so it was added as the plant component for flavouring the mead and was not part of the honey (Henshall 1964, 178f). One interpretation of the English and German names for meadowsweet or mead wort (Filipendula ulmaria, common German name: Mädesüß) is that it sweetens the mead. I have chosen to present a non-alcoholic version of the drink with meadowsweet - a preliminary stage of mead so to speak. The hazelnut honey croquant is based more on the interpretation of individual finds rather than a definite find of the product. At the archaeological site of Arbon Bleiche III (the findspot of the wooden pipes interpreted as a Neolithic log-hive) there was an exceptionally large amount of hazelnut shells found (Leuzinger 2012, 311). If there was beekeeping which resulted in honey for consumption, along with hazelnuts, I presented the croqant hypothesis, as the combination of these these two foodstuffs would produce a storable and transportable food with a high energy density. Apart from archaeological integrity, the drink and croquant was much appreciated by the participants. Plans for producing the drink for themselves were discussed among the group, along with the comparison between pressed and extracted honey . The technique of extracting honey by using a centrifuge was not applicable in prehistoric times because there were no removable frames. The honey had to be squeezed, thus providing it with different ingredients and a different taste. Squeezed honey is extremely rare in Germany these days, and I would like to remind people of that archaic taste. It must also be stressed that during prehistory, the production of wax was as important as honey and not, like today, a secondary product merely of interest to the beekeeper. In squeezing the honey the wax is automatically harvested at the same time. For modern beekeeping this means less honey because the bees have to use a lot of energy for producing more wax - but on the other hand it can mean higher quality in wax and may also be more hygenic, because the bees are not forced to reuse waxcombs or the external wax. As mentioned earlier this project will be furthered with actual prehistoric-style beekeeping during Spring 2017. The replica of the Neolithic log-hive awaits becoming home to a bee colony. There are questions as to how the bees will adapt to this small habitation; for example, will there be a lot of swarming? When will be the right time to harvest and how can honey and wax be extracted without endangering the colony? This is probably a modern question, but nevertheless, it is important to figure out beforehand. What is an appropriate setting for the pressing of the honey? Maybe at night in order to not attract the bees living in the colonies nearby to the intoxicating smell of the honey? No doubt there will be many more questions emerging while actually implementing the project. It will also be very interesting to find appropriate beekeeping tools, supplies, clothes and so on for the environment of an archaeological open-air museum. Ongoing information about this project will be provided in Social Media via www.facebook.com/immenzit and about all the activities of the Zeiteninsel in the blog www.zeiteninsel.wordpress.com. Fig 6. Poster „Themed guided tour Bronze Age“. Guber, 2016. 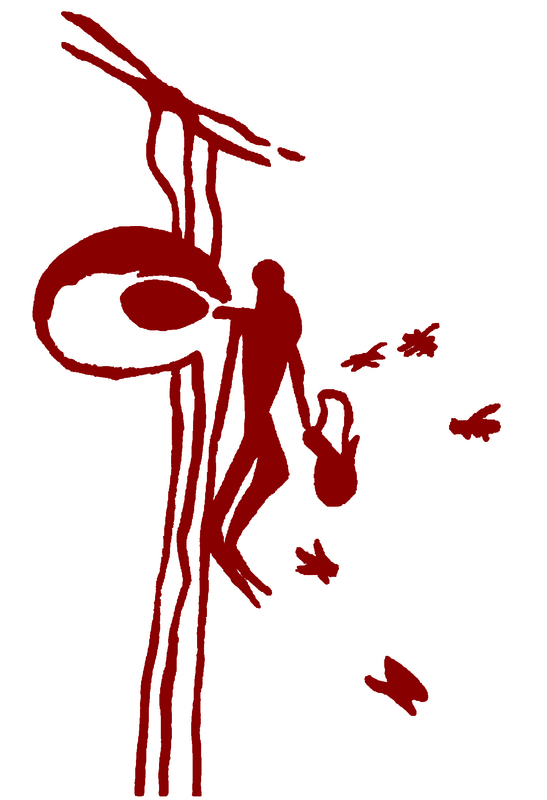 CRANE, E. (2001).The Rock Art of Honey Hunters,Cardiff: International Bee Research Association. DE CAPITANI, A., DESCHLER-ERB, S., LEUZINGER, U., MARTI-GRÄDEL, E., SCHIBLER, J. (2002). Die jungsteinzeitliche Seeufersiedlung Arbon Bleiche 3, Funde. Departement für Erziehung und Kultur des Kantons Thurgau. GUBER, S. (2016). Imkerei und Archäologie in die biene/ADIZ/imkerfreund, 4/2016-11/2016, München. HENSHALL, A. (1964). A dagger-grave and other cost burials at Ashgrove, Methilhill, Fife. Proceedings of the Society of Antiquaries of Scotland. 97, 166-179. KÖRBER-GROHNE, U. (1985). Die biologischen Reste aus dem hallstattzeitlichen Fürstengrab von Hochdorf, Gemeinde Eberdingen (Kreis Ludwigsburg). Mit Beiträgen von Klaus HAAS, Günther VORWOHL, Roland WURSTER in: Hochdorf, I. Forschungen und Berichte zur Vor- und Frühgeschichte in Baden-Württemberg, 19, 85-164, Taf. 1-50, Stuttgart. LEHMANN, H.(1965). Ein dreitausendjähriger „Klotzstülper“ aus Berlin-Lichterfelde in Berliner Blätter für Vor- und Frühgeschichte. 11, 1965, Berlin. LEUZINGER, U. (2012). Ziegenkot – Fischbandwurm – getrüffelter Gerstenbrei. Das ausserordentliche Informationspotential der neolithischen Feuchtbodenarchäologie, in: GLESER, R. und V. BECKER (eds): Mitteleuropa im 5. Jahrtausend vor Christus. Beiträge zur Internationalen Konferenz in Münster 2010, Berlin. ROFFET-SALQUE, M., REGERT, M., EVERSHED, R.P., OUTRAM, A.K., CRAMP, L.J., DECAVALLAS, O., DUNNE, J., GERBAULT, P., MILETO, S., MIRABAUD, S., PÄÄKKÖNEN, M., SMYTH, J., ŠOBERL, L., WHELTON, H.L., ALDAY-RUIZ, A., ASPLUND, H., BARTKOWIAK, M., BAYER-NIEMEIER, E., BELHOUCHET, L., BERNARDINI, F.1 BUDJA, M., COONEY, G., CUBAS, M., DANAHER, E.M., DINIZ, M., DOMBORÓCZKI, L., FABBRI, C., GONZÁLEZ-URQUIJO, J.E., GUILAINE, J., HACHI, S., HARTWELL, B.N., HOFMANN, D., HOHLE, I., IBÁÑEZ, J.J., KARUL, N., KHERBOUCHE, F., KIELY, J., KOTSAKIS, K., LUETH, F., MALLORY, J.P., MANEN, C., MARCINIAK, A., MAURICE-CHABARD, B., MC GONIGLE, M.A., MULAZZANI, S., ÖZDOĞAN, M., PERIĆ, O.S., PERIĆ, S.R., PETRASCH, J., PÉTREQUIN ,A.M., PÉTREQUIN, P., POENSGEN, U., POLLARD, C.J., POPLIN, F., RADI, G., STADLER, P., STÄUBLE, H., TASIĆ, N., UREM-KOTSOU , D., VUKOVIĆ, J.B., WALSH, F., WHITTLE, A., WOLFRAM, S., ZAPATA-PEÑA, L., ZOUGHLAMI, J. (2015). Widespread Exploitation of the Honeybee by Early Neolithic Farmers Nature. 527, 226-230. RUTTNEER, F. (1981). Ein Bienenkorb von der Nordseeküste aus prähistorischer Zeit in: Werner HAARNAGEL (ed. ): Feddersen Wierde: die Ergebnisse der Ausgrabung der vorgeschichtlichen Wurt Feddersen Wierde bei Bremerhaven in den Jahren 1955 bis 1963. III, Steiner, Wiesbaden.